Description: Cap 2 to 10cm, white, margin becoming wavy and lobed with age; gills white, decurrent; stem lateral, stubby to non-existent; flesh white; smell and taste mild; spore print white. Habitat: Coniferous logs and stumps, mid-fall. 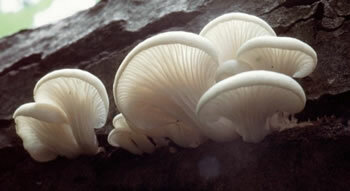 Primary keys: White cap, gills, flesh and spores; growing in ranks laterally from rotting conifer logs. Edibility: Good with a delicate flavor, but older specimens can be wet and wormy. Notes: Harvest Angel Wings when still fresh and young. Cut them carefully free from their log and put in a bag immediately to keep them clean. Note that there were some fatal poisonings from this species in Japan in 2004. However, most of the victims were elderly, all had previously damaged kidneys and they had eaten a large quantity. There have been no poisoning reports in North America. Add the carrot, cabbage, Angel Wings, dashi, tofu, nori and soy sauce to a soup pot. Bring to a low simmer for 5 minutes. Remove from the heat. Remove 1 C. stock to a bowl, and whisk together with the miso. Add the miso/stock back to the pot and let sit a couple minutes. Ladle into 4 individual bowls and top with green onion.